Happy Valentine's Day! Whether you're single or taken, I believe we all can agree that food is number one in all of our hearts. While an amazing dinner should be a given today (whether your dining alone or with a significant other), I wanted to try something new in the sweets category. In using dried culinary rose petals and buds for tea in the past, I wondered what it would be in a chocolate bark. Not only was this experiment a win, but it was also super easy and fast to put together. Talk about a major Valentine's Day win!! This is a MUST TRY. 2. Gently steam dried culinary rose petals and buds. This will allow you to better remove the petals without it crumbling. Place petals in a separate container or dish for topping. 3. Using a double boiler melt the white chocolate. Be sure to not allow the water to boil during the process. While melting, add in vanilla extract and rose water to chocolate. 4. Once chocolate is completely melted, pour onto baking sheet. 5. 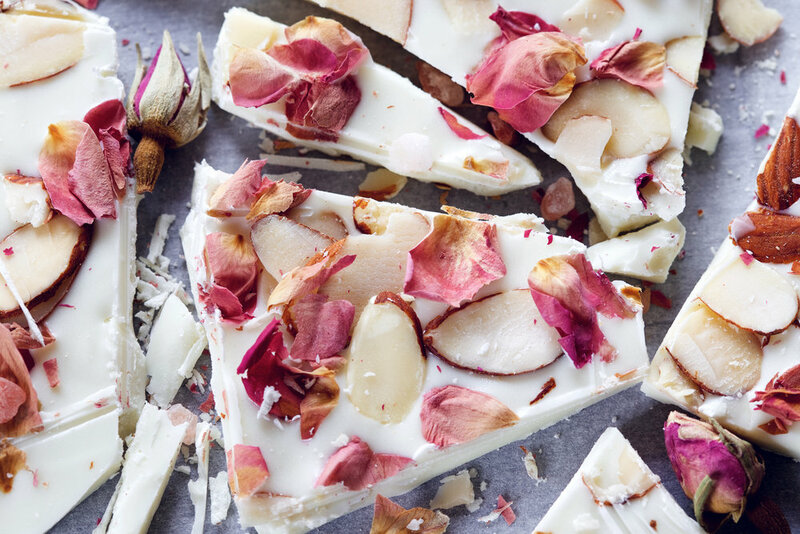 Immediately top with rose petals, sliced almonds and pink salt (optional). 6. Place baking sheet in refrigerator for 1 hour (or freezer for 30min).